The Vancouver Condo Buzz » Westside Vancouver KILLARNEY RIDGE Homes & Duplexes for Sale! « From $230’s! Affordable South Surrey Townhomes for Sale at SOUTH POINT WALK Townhouses by Streetside! Westside Vancouver KILLARNEY RIDGE Homes & Duplexes for Sale! 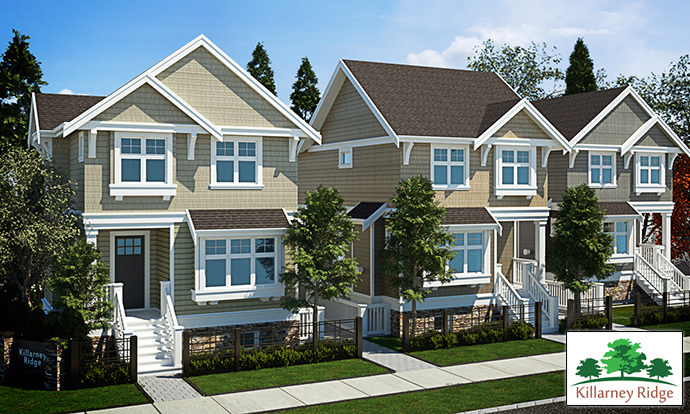 Only 8 exclusive single family Vancouver houses and duplexes are available for sale this Spring 2014 at Killarney Ridge real estate development project. The central location is at East 41st Avenue and Killarney Street Vancouver, which is next to the beautiful Earles Park, public transit routes, and a community school. Please visit www.killarneyridge.ca for more details today! The interior finishes are absolutely stunning. The Westside Killarney Ridge homes in Vancouver will feature living areas with fireplaces that have decorative wood mantle or stone finishing as well as built in mount television above the fireplace and engineered hardwood floors. The home plans will also feature powder rooms on the main level with porcelain tiled floors or engineered hardwood floors in addition to under mounted sink with single lever chrome faucet and wood vanity cabinetry. The separate dining space at the Westside Vancouver Killarney Ridge homes for sale will have engineered wood floors and feature pendant lighting. The high-end kitchens have stone counters with clean edges, recessed pot lighting with pendant accents, stainless steel appliance set, stainless steel sink, shaker style wood finish (all with soft close cabinetry) and engineered or porcelain tiled flooring. The main bedrooms have beautiful nylon carpets with ceiling mount lights and quality closet organizer while the master bedroom also has nylon carpets with comfortable and thick underlay and quality closet organizers. The ensuite bathrooms have gorgeous 60” wide bath tub with rain shower head, shaker style wood finish with soft close cabinetry, under mount sink with stone counters and porcelain tiled floors and full height wall tile work in the shower/tub surrounds. The common area features at the Westside Vancouver Killarney Ridge homes include pre wiring home security system with key touchpad, two inch wood faux blinds, front loading washer and dryer, complete HRV system and premium vinyl windows. As mentioned, the Vancouver West Side location is also one of the greatest selling features for Killarney Ridge. Here, you will have all the urban conveniences at your doorstep and within walking distance from your home. As for transit, the Killarney Ridge Vancouver West Side homes are very close to Bus Station 41 in addition to being just five minutes away from the Joyce SkyTrain Station and Killarney Community Centre, Rec Centre and urban greenspace/parks. As well, you are a five minute drive away from Champlain Heights. Twenty minutes away, home owners at the West Side Vancouver Killarney Ridge homes and duplexes are at either SFU or UBC, the YVR Airport/Richmond, Tsawwassen Ferry Terminal to the south and local North Shore mountains to the north. Other urban parks nearby include Riverfront, Everett Crowley, Killarney, Norquay and Earles Parks. 10 minutes away is all the shopping and series at Oakridge, downtown Vancouver, Queen Elizabeth Park, the Canada Line SkyTrain and VanDusen Botanical Gardens. The local YMCA and Langara College are also just ten minutes away. Top ranked private and public schools are also close by. Even closer (5 minutes drive) from Killarney Ridge Vancouver homes is the SkyTrain, Metrotown Shopping Centre, Metropolis and Fraserview Golf Course. 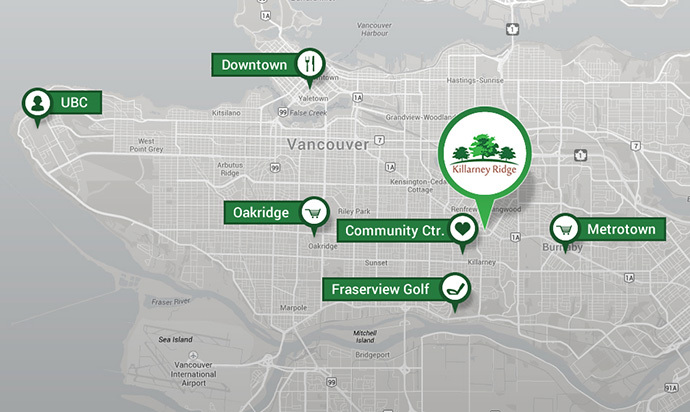 The Killarney Ridge development features only 8 residences for sale in a popular and established Vancouver West Side neighbourhood. This project will offer only 6 single family detached homes and 1 duplex residence featuring two half duplexes for sale. Construction will start in Summer 2014. The address is 1120 – 1200 West 73rd Avenue Vancouver BC. The Killarney Ridge homes are brought to you by TATLA Developments and Henry+Glegg Residential Design. Please visit our blog often for the latest information and launch of floor plans available at this project.